The original idea to create an exact copy of a CD-ROM disc and place the data into a file which can be stored on a hard drive or USB flash drive was a great invention. This made it possible to store collections or backups of your important optical media in one location. These files, which can also store a copy of DVD or Blu-ray media as well, are more commonly known as ISO images. Even Microsoft these days utilizes ISO image files and some versions of Windows are distributed as an ISO. ISO image files can easily be created, all you need is an optical drive and a real optical disc, alternatively they can be downloaded from many sources on the internet. Once you have the file stored on your computer, there’s several things you can do with it. The ISO can be burned to a new CD or DVD to create a copy of the original disc, it can also be written to a USB flash drive to install something like Windows or Linux more rapidly. Another option is using software to make the ISO image behave like a real disc, this allows you to install apps and games or read the disc just like if it was physically inserted into your computer. The software to use is known as virtual drive software because the drive isn’t real and it just emulates a real optical drive, the ISO image is then mounted to the virtual drive to create a virtual disc. Here we list 10 free virtual drive emulators that you can use to mount ISO images so they behave like real discs. Although Virtual CDRom Control Panel dates back to 2001, Microsoft re-released it in 2013 with a new webpage and an announcement that the program does actually run on XP, Vista and 7 despite its age, but Microsoft themselves offer absolutely no support for it. What we like about this tool is it doesn’t require installation to mount ISO images and the whole package is under 60KB in size consisting of only a driver file, executable and a Readme file. It isn’t as intuitive and easy to use as some other tools and requires some manual work to install the driver, so make sure to read the Readme.txt carefully. This is a useful addition to the DVDFab range of tools that specialize in video ripping, conversion and playing. 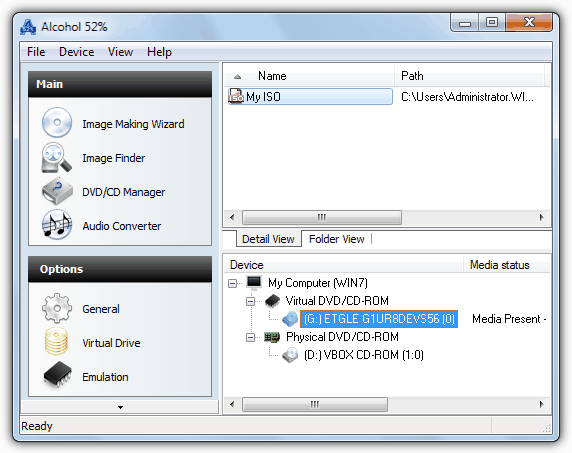 Virtual Drive is like a simplified version of Daemon Tools but has some nice advantages like support for up to 18 virtual disks, mounting a Blu-Ray ISO image or folder so it can be played in PowerDVD, and no adware/media tools offered during the install process. Although it doesn’t say on the website CD ISO images are supported, they work fine. DVDFab Virtual Drive supports mounting 8 types of disc image and can also create the newer .Miniso Blu-Ray format ISO images. It works on windows XP and above. Mounting an ISO image file using WinCDEmu is really easy. Just install and all you need to do is to double click on the ISO image file to automatically mount it to a drive letter. If you want to unmount, just right click on the drive and select Eject. 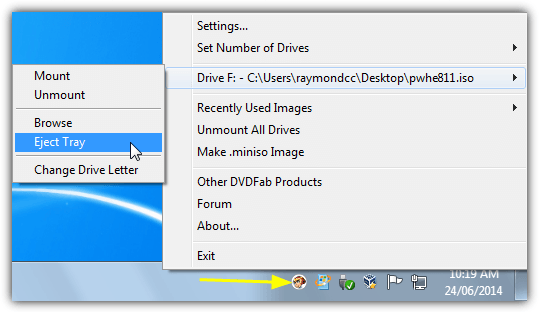 WinCDEmu has a simple option to create an ISO from a CD/DVD or Blu-Ray disc, just right click on the drive in Windows Explorer and Choose to Create ISO Image. A useful option for administrators is the requirement for admin rights to mount an ISO image. A portable WinCDEmu is also available but isn’t quite as up to date as the setup installer version. There is support for XP to Windows 7 including 64-bit, Windows 8/8.1 is not listed but works fine. 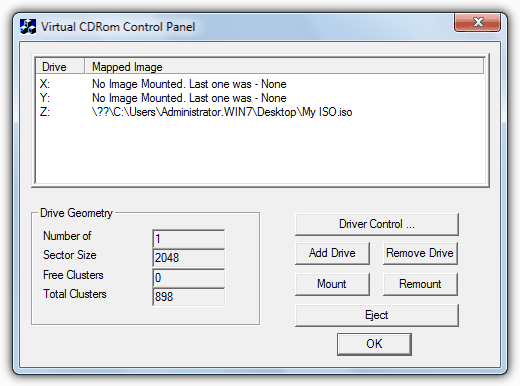 Virtual CloneDrive is very simple to use, supports a number of different image file formats to mount a virtual disc, and allows up to 8 virtual drives at the same time. While there are no extra or advanced options available like creating or burning an ISO etc, which can be found in some other software, usage is as easy as double clicking on an ISO image file to auto mount it as a drive or right clicking on the tray icon. This is just a simple, no frills, light on resources and effective image mounting utility that does its job well. Supports from Windows 98 up to Windows 8/8.1 64-bit. MagicDisc is created by the same developer as the popular MagicISO image creation software. It can mount a wide range of CD/DVD image formats and can also create a CD/DVD image from disc. The program has no GUI and works entirely from the right click context menu found on the system tray icon. It supports just about everything from Windows 98 up to Windows 8. Make sure you download the correct version as there are 5 different ones available! One for 98, 2000 and ME, one for Windows 7 (x86 and x64), another for Windows 8 (x86 and x64), and separate 32-bit and 64-bit versions for XP, 2003, 2008 and Vista. WinArchiver is a shareware archiving software and this is the standalone virtual drive component from it which is completely free. The creators, Power Software, also develop the excellent PowerISO. 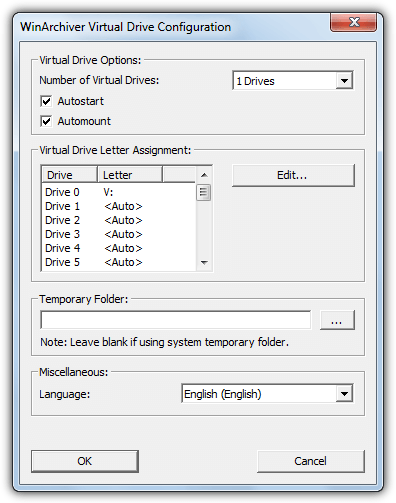 In addition to being able to mount up to 23 virtual drives and selecting a specific drive letter for each, WinArchiver Virtual Drive has another trick up its sleeve. That is the ability to mount just about any type of file archive as a virtual drive. Zip, 7z, RAR, WIM, CAB and many other types of archive can be mounted without actually extracting the archive first, useful for large movie or game archives. Over 25 disc image formats are also supported. Works on Windows 98 and above. 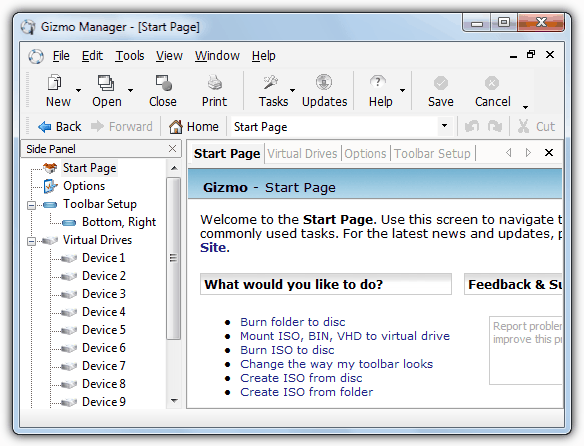 gBurner Virtual Drive is another free ISO mounting software that uses the Power Software virtual disc driver. It’s almost identical to WinArchiver Virtual Drive apart from it supports 16 virtual drives and not 23. While ImDisk is certainly a bit more complicated to use than the other tools here, it is very powerful because in addition to the option to mount ISO CD or DVD ROM images, you can also create removable or fixed virtual hard disks and floppy drives. These can be created in system memory to behave like a RAM disk which can be written to, and then saved out to a .img image file while being reloaded and reused at a later date. 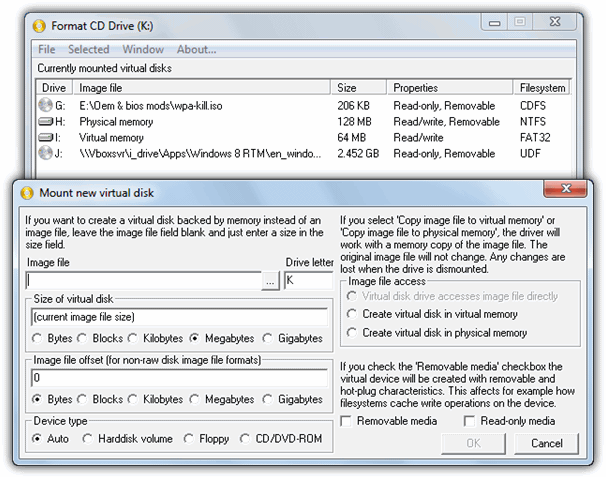 ImDisk Virtual Disk Driver is installed and accessed via a Control Panel entry, and is compatible with Windows NT up to Windows 8/8.1 64-bit. The Gizmo Drive tool is part of a larger suite of tools called Gizmo Central, although you can turn off the other tools during install. This is the only free virtual disc emulator that can create an image from both disc and folder. There are some other useful options like mounting virtual hard disc (VHD) files, and also a function to burn a folder or ISO to disc. Gizmo Drive also has a very handy function which is the built in support to create a RAM Disk. Have a read of our RAM disk benchmark article to see how it performs. It works on Windows 2000 up to Windows 7 64-bit. Be careful during installation because Daemon Tools will ask to install adware. You will need to select the Free License during the install process, and there is also a feature pre installed by default which is an online service called Mountspace. The number of supported image formats to mount ISOs is huge and you can also create an image from a physical CD, DVD or Blu-Ray disc. Up to 4 virtual drives are supported including a SCSI virtual drive which can emulate music and game disc protections. A more recent feature adds burning an image to CD/DVD via Astroburn. Supports Windows 98 and upwards. The free version of Alcohol 52% supports up to 6 virtual drives, RMPS protection emulation which can help with game and music disc DRM etc, an option to create images from physical discs and a CD/DVD manager that gives detailed information about drives and discs. There is also a freely downloadable Audio Converter add-on option which can rip music discs to MP3. Alcohol 52% Free Edition works on Windows 2000 up to and including Windows 8/8.1. The free versions of Alcohol now require you to install “Smart File Advisor” and you cannot deselect it, trying to uninstall later will uninstall Alcohol 52% as well. For this reason we recommend you only use Alcohol if you specifically need one of its features. yeah.in all os,you double-click,you mount it.but we”re talking about virtually mounting it. I’m using WinCDEmu it’s very good and simple to mount a ISO. Thank you very much, Raymond. Your article helped me out after bashing my head against the wall trying to mount an DISK image using a different program and having it fail time after time. Your #2 listing got the job done. Thank you again! Thanks RAY for another wonderful article. I think ‘WinCDEmu portable’ is the easiest to work with ( at least for the job ! ). thanks & regards. figure I’d try and save people the trouble of trying to use it and wasting time trying to figure it out. also have to right click the exe and run as administrator. I have owned and used Alcohol 120% for over ten years now. It is NOT free but worth every penny. All updates have been free. It also handles several different file formats. It comes with a program called ACID which you run when a program is requiring an actual CD/DVD be in the drive. It makes it look as if the virtual drive is a real drive. The default file format is Alcohol’s MDF file format but you can reset that to be ISO. Alcohol 120% is also smart enough to know that if you want to make a copy of a double layered DVD that it needs to switch over to using a BIN type image rather than an ISO image. Again, I felt it was worth the money to buy the full blown version and over the six hard drive crashes caused by viruses or hackers or just a bad disk – Alcohol 120% has been there every step of the way. In Windows 8 and Windows 10, there is no need for third party software. Double-clicking will mount it automatically. Don’t post fake info, idiot. Windows 8 & 10 will ask “How would you like to open this file”. Then they show a list of programs, none of which mount .iso files. Third party is required for every version of Windows. You’ll need to set a virtual drive in the first place, otherwise Windows wouldn’t know where to mount the image! JK, double-clicking an .iso mounts it automatically in Windows 10 (don’t know about 8 but for what I read it was already implemented then. “otherwise Windows wouldn’t know where to […]” you obviously don’t know what “coding” means. gBurner did not work for me on Win7 64-bit. As a matter of fact… when I uninstalled it and restarted my Avast AV software didn’t start! These ‘free’ versions always scare the crap out of me. Tried WinCDEmu instead. I only really need this to mount and install software from an iso. Like it thus far… and like the Windows Explorer shell integration. 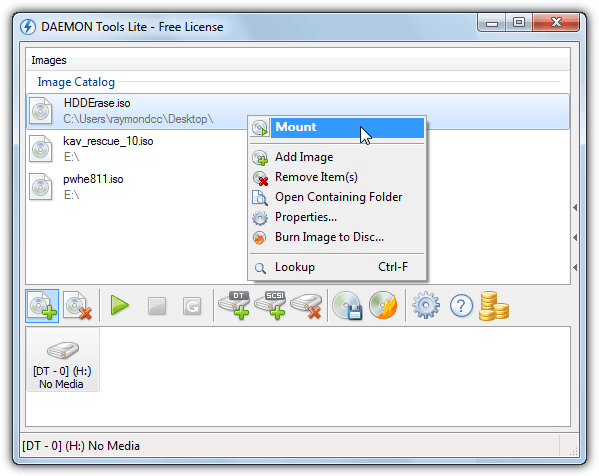 Just installed on the 9/Nov/2015 Demon Tools offers 3 license options when installing, one is a free license, one is a personal license and the last is a commercial license. There is still a free version available of DT Lite, it asks you to select the paid or free version on install. Mounting/Virtual Drives are not free with DT Lite. Before writing this comment I was able to install DT Lite Free and mount 2 virtual SCSI devices without an issue. It certainly is still possible to mount drives in DT Lite Free. It is no longer free, you are only able to get free trial now. When I install DT-Lite it offers the free version on install and in the program it says “Free license” with limited support. I’ve seen no mention of a trial version anywhere, where are you getting information it’s a trial only? I have just this moment downloaded it again and installed, it offers the personal license, commercial license or free license (with adware offers) on install. Running DT-Lite it tells me I have a free license with limited support. Are you saying the “free license” is really a trial or it’s telling you that you have a trial version?? I have just downloaded it and i can confirm that you get the option for free license upon installing the software. Just downloaded November 9 2015 still free!! I think you have a serious vision problem! OSF MOUNT is free and the best!!! Nice one pupper just tried it and it’s fantastic. My new fave iso tool. For all intents and purposes OSF Mount is essentially just a clone of IMDisk (I have both so I’m able to state this truthfully). when im not using windows 8, i use wincdemu. it is only a small ap and can do the exact same thing. just one pop up box for the first time, you can easily remove it though by clicking automatic and ok.
also comes with free spyware and malware so awesome don’t wait! ImDisk is hands down the best solution for mounting ISOs and other images. Its lighter than any other one on the list, as its not a bloated adware ridden pile of bad codjng. It’s just a filesystem driver. It has more features than the others, and games don’t use disc protection anymore. Youcan also make images of any of your disks, flash drives, and cds/dvds/blurays for backups or just to access the data from a file. Dont use that ofher garbage. i dont know much about IT but its nice that people actually take the trouble to write this so i know which is best to download. finally taking the emu. kind regards. I’ve been using MagicDisс for CD emulation for almost ten years. It’s the easiest. And I tried ImageBurn also. Try it yourself. You will see how simple and good it is. I have Windows 7 and NONE of the “Clone Drive” programs work, including Disc Magic. The only one working so far is ‘Virtual CDrom Control Panel’ on Win XP but not on 7!! PowerISO is best option for windows 7, works great. ISODisk it]s so cool and simple. As an IT company we have been using MagicDisc for almost a decade and we use it weekly. Within the past few months it has failed more often than worked on Windows 7 computers. There seems to be a huge compatibility issue with the MagicDisc driver that it installs. Unfortunately, it is costing us time and money, so we will be using ImageBurn. MagicDisc is crap with larger DVD images. To test, simply copy a file that is physically near the “end” of the image. Boom “MS-DOS error” – it’s junk. Even worse is that it is the most impossible program to completely uninstall. A Big time waster. Tested on multiple win7-x64 systems. Maybe it is better on other versions. Guess what? IMGBurn has the same problem, only you can actually uninstall it. Imageburn is by far the best. I have tried most of the others. Imageburn has the smallest footprint of most of these. It performs all the necessary functions that a basic user needs. It mounts ISO to DVD flawlessly. If you have a DVD with content on it, Imageburn automatically detects it and asks you if you want to clean the disc. It will do that and then begin the analysis before the burn. I tried Alcohol 120%. Everyone says it is the best. Imageburn does everything Alcohol does for the basic user and Imageburn is free. I felt compelled to submit this because of the headaches and pains I went through with all the other listed crapware before I stumbled upon Imageburn. Simple and intuitive UI, no bloat, fast download, install and performance, extremely accurate after 30 or so burns (DVDs perform flawlessly… and best of all, it’s FREE! IMGBURN doesnt create a virtual drive to mount an .iso file does it? You are correct, I believe Syndey has got confused between mounting ISOs and creating/burning ISOs! Thanks for the info. Failed to install Microsoft Virtual CDRom Control Panel on my Win7 x64. Installed the 2nd one and works fine. Thanks for posting this Raymond. Yes, never heard before about Microsoft Virtual CDRom Control Panel. Will give a try. I’m currently using Virtual clone drive. Its easy and doesn’t require a restart during installation unlike daemon tools. I’ve had a lot of success mounting using WinCDEmu on windows 7. It’s a piece of cake. Just install, find the image, then right-click over it and choose “mount”. You can mount it with any letter too. Piece of cake! That’s really amazing. Thanks very much. …that is, unless they’re compressed. Occasionally, one will encounter an ISO file that was created and then, further, compressed using MagicISO. PowerISO can’t handle that, so that’s where the little free MagicDisc utility (mentioned above) comes in. 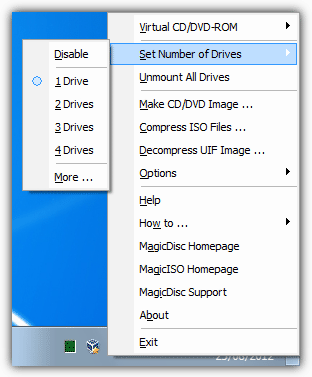 MagicDisck can uncompress any file compressed by its parent MagicISO product. Once its uncompressed, then PowerISO (or, really, most any freeware or commercial ISO handler) can take it from there. So, then, my point is, one should use whatever primary ISO handler that one wants to use. Most of them (including PowerISO) will mount any ISO as a virtual drive. However, because of the MagicISO compression thing, the smartest thing one can do is download and use that free little MagicDisc and let it sit in the system tray. Because it will mound multiple virtual drives, you can just let it be what you use for that purpose. But its REAL value will kick in whenever (if ever) you encounter a MagicISO-compressed ISO that you wish to use with something like PowerISO or ImgBurner or some other much more sophisticated and feature-rich ISO handler. All of the choices in the primary article are nice and interesting, but with that free little MagicDisc utility running in one’s system tray, one need only add whatever is one’s choice of primary, feature-rich, freeware or commercial ISO handler software, and one will have all one needs… ever. NOTE: Remember that when I say “all one needs” and “ever,” I’m referring strictly to ISO handling, not DVD or CD ripping or decoding or anything else. There are fine utilities for those things. This article just covers CD/DVD virtual drive mounting and the free utilities that will get it done. My point with this posting is to suggest that there’s only one choice from the above because of the vexing problem of how to handle ISO files (of whatever format) which are further compressed by MagicISO. Only the MagicDisc utility, above, will do that, so since one is likely to encounter MagicISO-compressed files in one’s downloading experience, one might as well just get the one tool from the above list that will not only mount virtual drives, but will also handle the vexing MagicISO-related decompression problem. From there, use whatever ISO handler you like. Or so it is my advice, for whatever that’s worth. 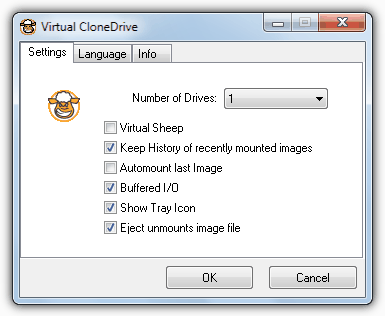 I personally use Virtual Clone Drive, it’s really light weight, size and resources wise, plus it has a sheep on it! but for making my ISO’s and such I use IMGburn. Alcohol 120 is the best in terms of overall features. Daemon Tools is the best in mounting images and virtual drives. It just lacks writing capability which Alcohol 120 has. My problem is both good programs can’t be installed in my Windows 7 system as of the moment. I think they both installs SPTD layer or something which Windows 7 Beta won’t allow for now. UltraISO works on Windows 7 and I’m using it. You should try it. You can open image files with it without mounting it to virtual drives. You also can edit the image file’s contents and save it. I’m just scouting for other programs of the like for now. Just passing by.. hehe.. Thanks raymond for the best is magicdisc..
Great programs Raymond ,I use always Power ISO its very good too . Power Achiever 2009 (professional) can also mount an ISO file and it makes the mounted drive physical. Is there any free portable application to mount! another one, very good and with source code is ImDisk Virtual Disk Driver. The community is active. It’s not really a program but a driver. Works on XP/Vista.